Every day, the general public is bombarded with advertising material: Junk mail, television ads, newspaper classifieds, billboards, web pages and internet pop ups, promotional emails - how do you create a custom promotional product that stands out in a saturated market place? 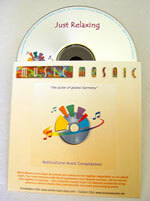 Music Mosaic presents the perfect solution for a unique promotional gift. With over 100 independent artists and labels under licensing contracts, we can create a custom music CD for your business - your own corporate soundtrack! Tell us what you need, write to us - click . Enhance the new car 'feel' with a custom CD to suit the mood - world beat tunes for a sports car, easy listening for a limousine. Create the perfect ambience for your place of business - gentle healing sounds in health spas, soothing music in a medical clinic, perhaps even create custom 'on hold' music to keep customers interested and entertained while they wait for you. Use a unique promotional gift to enhance the effects of your products - music suitable for massage to accompany aromatherapy oils, beauty products accompanied by a relaxing music compilation. 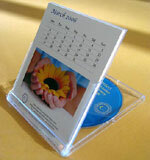 A custom promotional item to give to clients at function centres. A mix of Australian themes (eg. Didgeridoo music) as a gift to foreign guests at Australian hotels (individual compilations to suit international hotels from various countries can also be created). A gift to attract younger customers to businesses with mostly mature age clients, creating a more modern image to grow their client base. A special compilation created specifically for hi-fi systems to showcase sound features as a gift for customers. Music is a fluid, flexible medium that can be used to enhance product/service presentation in almost any field. Whether you're creating a business corporate gift, a unique promotional item or just some easy listening for the waiting room, we can create a CD specifically for your requirements. More info? Contact us us at customcd@music-mosaic.com. World fusion music: World-beat, tribal, chill-out, ethno trance dance, Eastern groove, Sufi music, didgeridoo or drum music. Note: If you produce a custom DVD, we can help you select suitable background music. For more information about a unique custom promotional product - a music CD -, please send us an and give your customers a gift that makes you stand out from the crowd. Music Mosaic: Mullumbimby, NSW 2482, Australia Tel: +61-2-6684 5089 - - All content is © copyright material.